The Mid-Atlantic Regional Spaceport's Commercial Launch Pad-0A at NASA's Wallops Flight Facility on Wallops Island, Virginia, has been fully repaired after an October 2014 rocket explosion. 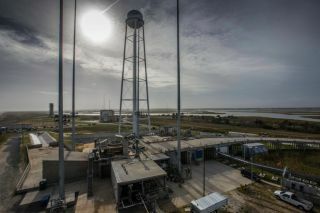 WALLOPS ISLAND, Va. ─ It's taken a year of repairs, but a commercial launchpad on Virginia's Eastern Shore is once again ready for private rocket launches bound for the International Space Station. The place is Pad-0A: a seaside launch site here at NASA's Wallops Flight Facility where — just over a year ago — an Orbital ATK Antares rocket exploded in a brilliant fireball just after liftoff, destroying an unmanned Cygnus capsule crammed with NASA cargo. Today, only a few traces of the rocket explosion remain, like a black smudge of charred paint, high up on a nearby water tower. Dale Nash, executive director of the Virginia Commercial Spaceflight Authority, (center), gives members of the press a tour of the Mid-Atlantic Regional Spaceport Pad-0A at NASA's Wallops Flight Facility in Virginia on Dec. 17, 2015. The launchpad has been repaired after an October 2014 rocket explosion. Altogether, NASA, Orbital ATK and the state of Virginia have spent $15 millionto repair and modify Pad-0A, which cost $120 million to build initially and is overseen by Virginia's Mid-Atlantic Regional Spaceport. Those repairs included the replacement of four lightning towers around the launchpad, the removal of debris from the explosion, as well as environmental cleanup of water and topsoil contaminated by rocket fuel. The explosion itself carved a crater 50 feet wide (15 meters) and 30 feet (9 m) deep just to the side of Pad-0A, but to the untrained eye little remains of that damage. Nash said that a concrete wall designed to protect much of Pad-0A's intricate plumbing systems did its job well. The force of the explosion did crack the foot-thick concrete slab, so it had to be replaced, but much of Pad-0A weathered the explosion well. "It happened in probably as good a place as it could have," Nash said of the explosion. Pad-0A is the primary launch site for the Antares rocket, built by Orbital ATK to launch the company's Cygnus cargo ships to the space station for NASA. The site hosted three successful Antares rocket launches (one test flight and two official deliveries) before the fateful explosion on Oct. 28, 2014. An Orbital ATK Antares rocket explodes just after launching from Pad-0A at NASA's Wallops Flight Facility on Wallops Island, Virginia, on Oct. 28, 2014. The rocket was carrying an unmanned Cygnus spacecraft filled with NASA cargo. Orbital ATK traced the rocket failure to a turbopump problem in one of the two AJ-26 rocket engines used to power the first stage of the Antares rocket. The company has since switched to new Russian-built RD-181 rocket engines to launch the Antares rocket. Orbital ATK aims to test the new engine setup in March, with a Cygnus launch on an Antares to follow in late May. If all goes well, a second Cygnus delivery flight on Antares will fly in October 2016. Engineers with Orbital ATK say they can't wait to see their retooled rocket fly. "It's huge for us," said Mike Pinkston, Antares program manager for Orbital ATK." We're a launch company, a launch vehicle provider, and to be able to get back to building launch vehicles and getting ready to fly at a full launch tempo is just a great feeling." "I can't wait to get one out on the pad," Pinkston added. While waiting for those rocket modifications to be completed, Orbital ATK will launch two Cygnus flights to the space station using the Atlas V rockets build by rival launch provider United Launch Alliance. The first Cygnus to launch on an Atlas V rocket blasted off Dec. 6 and arrived at the space station three days later. The next one is set for around March 10, Orbital ATK representatives said. On Oct. 28, 2014, an Orbital ATK Antares rocket exploded shortly after liftoff from the Mid-Atlantic Regional Spaceport's Pad-0A at NASA's Wallops Flight Facility on Wallops Island, Virginia. NASA photographer Joel Kowsky captured this view of fire and smoke at the launchpad after the explosion. Orbital ATK plans to launch 10 cargo flights for NASA under a $2.6 billion contract to deliver fresh food, gear and other supplies to the International Space Station. Of those 10 planned flights, Orbital has launched four so far, including last week's Cygnus flight on the Atlas V rocket. Another company, the California-based SpaceX, has a $1.6 billion contract for 12 delivery missions using its own Dragon spacecraft and Falcon 9 rockets. SpaceX has launched seven cargo missions for NASA, with the last one in June failing during liftoff. SpaceX is expected to resume delivery flights for NASA in early January.